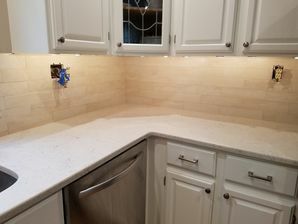 J & A Construction NJ Inc specializes in creating beautiful custom cabinetry, including: kitchen cabinets, bathroom vanities, entertainment centers, built-in bookcases, fireplace surrounds and mantles, and bars. J & A Construction NJ Inc has over 19 years of experience designing, building, and installing custom cabinetry. We will help you find exactly what you're looking for! If you've shopped the home center stores and can't find what you're looking for, J & A Construction NJ Inc can create a custom cabinet solution. Whether your home is formal, contemporary, or funky, J & A Construction NJ Inc will create beautiful, enduring pieces that will fit right in. Our skilled carpenters have over 19 years of experience creating unique custom cabinetry. We use quality hardwood for all of our work. Let our designers show you examples from our extensive gallery. We will work with you to choose the perfect cabinet style. Then, we'll help you select the right wood, stain or paint, and hardware to create a custom cabinet solution. Built to fit your space. J & A Construction NJ Inc will design and build quality pieces that take advantage of the space you have without making your room feel cramped. If you have a room with unusual dimensions that don't accommodate off the shelf products, we can create a custom piece that works. Invest in a beautifully hand-crafted product that will enhance the character of your home and the quality of your life. When prefabricated products don't fit the bill, call (201) 371-6061 for a custom cabinetry solution. J & A Construction NJ Inc custom cabinetry is one-of-a-kind. It reflects your lifestyle and your appreciation for quality hardwood products. Our knowledgeable craftsmen will build your custom piece with all the functionality you're looking for. Whether you're looking for open shelving to display collectibles or cabinet doors for discreet storage, we will create a beautiful piece that combines style, quality, and functionality. Call (201) 371-6061 to discuss your cabinetry needs.